Ding Yi's book "十 × 30 Years: Ding Yi's Works" is now available at ShanghART Library and online Store. With meticulous design and the clue of "十 × 30 Years" running through its entirety, this book is a retrospective presentation of Ding Yi's artistic practice over three decades. ShanghART Gallery is honoured to present Ding Yi’s solo exhibition "Interchange" on November 7, 2018, exhibiting his most recent paintings from the "Appearance of Crosses" series together with the sculpture "Painting Stand". 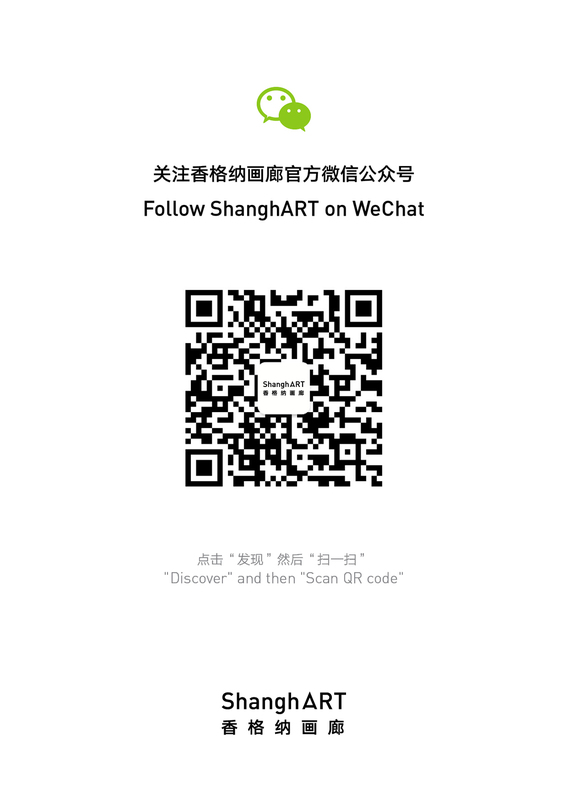 This is Ding Yi’s first solo exhibition in ShanghART spaces in China after 12 years. The exhibition continues until January 6, 2019. As the strongest visual component of Ding Yi's artistic practice, the latticed lines and patterns of crosses continue to be featured heavily in the exhibited works on basswood, canvas and paper. Refined from the meaning of "tridimensional" and "intersectional", the exhibition title "Interchange" indicates his recent exploration on the layers and composition of paintings. This can be examined in more than ten pieces of paintings on basswood finished after 2015: Ding Yi uses thicker and harder basswood boards as base, and covered them with heavy acrylic colours. Then he carves out strong and sharp lines or cut surfaces of different shades, thus creating resonance among brushstrokes, paint layers and texture of basswood. Since the late 1980s, Ding Yi's exploration of the pure and merely formalised signs of "crosses" appears throughout his artistic practice, the practice of a dedicated painter living in today's dense world. Presenting a contrast to the progression of materials and techniques, the constant "+" and "x" crosses vitalise his works with immersive rationality and order in an extremely simple gesture. The continuous and longstanding work process can be viewed as an evocation of energy. Behind the almost minimalist system is the accumulation of the artist’s self-discipline and instinct. Ding Yi started the “crosses” within the context of his confusion about urbanisation; however his artistic system showcases an inward tendency towards spirituality after three decades of endeavors. Paying attention to the macroscopic conception and specific objects, Ding Yi copes with the complexity of pictorial elements with a simple mechanism, which demonstrates his dialectical thinking about abstraction in an increasingly complex and interlinked time and world of challenges. Ding Yi (b. 1962) was born and currently resides in Shanghai. He graduated from Shanghai Arts & Crafts Institute in 1983 and graduated from Shanghai University with B.F.A. in 1990. The practice of Ding Yi encompasses painting, sculpture, spatial installation and architecture. He works primarily with "+" and its variant "x" as formal visual signals, above and against the political and social allegories typical of painting in China. He chose this sign in the second half of the 80s as a synonym of structure, rationality and of a pictorial expressiveness that reflects the essence of things. Ding Yi has exhibited extensively at various institutions and galleries, among many others, "Art and China after 1989: Theater of the World" (Solomon R. Guggenheim Museum, New York/Bilbao, 2017-2018); "Last Night's Fortune Teller: The Third Part of an Exhibition Series with New Acquisitions of Chinese and International Contemporary Art" (Daimler Contemporary, Berlin, 2017); "Une histoire: art, architecture, design des années 1980 à nos jours" (Centre Pompidou, Paris, 2015); "China 8, Contemporary Art from China at the Rhine and Ruhr"(Lehmbruck Museum, Duisburg, 2015); "Verso Est, Chinese Architectural Landscape" (Museo Nazionale Delle Arti Del XXI Secolo MAXXI, Rome, 2011); "Shanghai" (Asian Art Museum, San Francisco, 2010); "'85 New Wave, The Birth of Chinese Contemporary Art" (Ullens Center for Contemporary Art, Beijing, 2007); "Mahjong: Contemporary Chinese Art from the Sigg Collection" (Bern, Hamburger, Barcelona, etc. 2005-2009); "Living in Time, 29 Contemporary Artists from China" (Hamburger Bahnhof Museum Für Gegenwart, Berlin, 2001). His works has also been included in 45th Venice Biennale (1993), The First Asia-Pacific Triennial of Contemporary Art (1993), 11th Biennale of Sydney (1998), Yokohama 2001 International Triennale of Contemporary Art (2001), 6th Shanghai Biennale (2006), 7th Shenzhen Sculpture Biennale (2012), 7th Busan Biennale (2016). Solo exhibitions include: Guangdong Museum of Art (Guangzhou, 2018), Xi’an Art Museum (Xi’an, 2017), Hubei Museum of Art (Wuhan, 2016), Long Museum West Bund (Shanghai, 2015), Minsheng Art Museum (Shanghai, 2011), Museo d’Arte Modena di Bologna (Bologna, 2008), Ikon Gallery (Birmingham, 2005).